Bruxism is the medical term for unconscious teeth clenching and grinding, either while awake or asleep, which can lead to physical painful and severe dental problems. Chronic teeth grinding can cause headache, earaches, facial pain, and even migraines. Dental problems from bruxism include lose of tooth enamel, increased tooth sensitivity, and flattening and/or chipping of the teeth. Bruxism sufferers who grind and clench their teeth while sleeping frequently wake up with a sore jaw. Wearing dental mouthguards can help prevent grinding teeth while sleeping, but you’ll need to practice some self-restraint during the day. Protect your teeth no matter what your age! For children, it’s all about play time. But playing sports or being active never gets old. That’s a good thing! The bad thing is all that activity can put your teeth at risk. That’s why it’s so important to protect your smile with a sportsguard. Sportsguards protect your teeth from getting broken, chipped or, worse, knocked out. Custom sportsguards are available at Keele And Finch Dental. 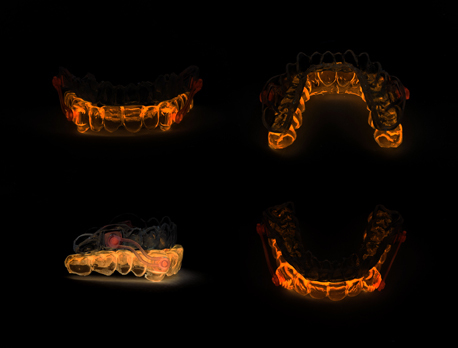 A dental sportsguard is ideal for all ages. With custom sportsguards, you can avoid all the pitfalls that come with the over-the-counter versions: poor fit and poor quality. Do you suffer from Snoring, Sleep Apnea or low sleep quality? Then perhaps Somnodent is the cure for your woes. Somnodent is ideal for patients who have been diagnosed with mild to moderate obstructive sleep patterns or sleep apenea. Contact Dr. Olvera today and find out if a Somnodent is the answer to your dental concerns.